Cantor Kenneth Feibush said he loves the “bring it on” mentality his new congregation has shown him. 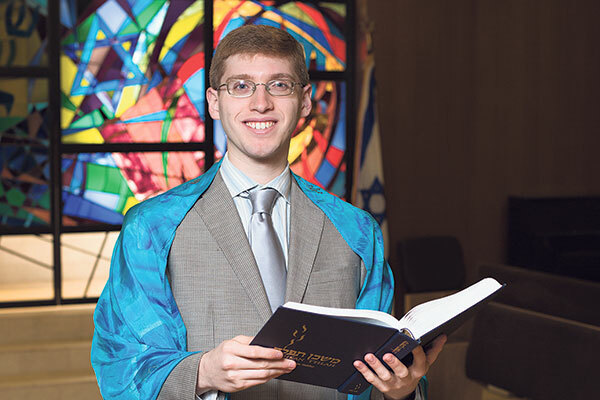 As far as Cantor Kenneth Feibush is concerned, a synagogue should be “a place where people know each other, where everyone is one big family.” And he said he’s found exactly that at Temple Sholom of West Essex in Cedar Grove, where he will begin his tenure on July 1. The newly minted cantor was invested by Hebrew Union College-Jewish Institute of Religion in New York City on May 8. He replaces Cantor Betsey Peters-Epstein, who will retire after 14 years with the Reform congregation. Feibush said he loves what he calls the “bring it on” mentality his new congregational community has shown him. “Everyone shows so much excitement when we’re on the phone and I’m e-mailing with different people in the community. I know they have so much love for [Peters-Epstein], and they know I’ll be different,” he said — although he still plans to maintain much of what she has built, from the choir to the way she organizes b’nei mitzva lessons. Classical music has a strong hold on Feibush, a lyrical tenor who grew up playing the violin and the viola and taking voice lessons, although, said the 28-year-old, “I’m still a kid of the ’90s. I’ll take the Back Street Boys and Michael Jackson any day.” It was only in cantorial school that he tried his hand at guitar. “It’s a necessity for the modern cantor. And much easier to bring with you than a pipe organ,” he quipped. Perhaps one of the most difficult pieces of the puzzle for him is Zionism. “I have a difficult relationship with Israel,” he acknowledged. “To take blindly the idea that I have to love Israel no matter what does not take into account the problems Israel has, even internally,” said Feibush, who spent a year there during cantorial school. He’s looking forward to settling in after so many internships with limited duration. His latest temporary position, at the Hebrew Tabernacle Congregation in Manhattan’s Washington Heights, ended after Shavuot. Feibush, who is single, is moving to Montclair as he begins his position.